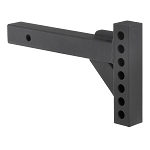 Please Note: This Andersen Weight Distribution Hitch not compatible with Atwood Actuators without modifications. There is a better way –and this is it! 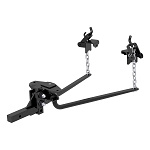 Our silent, 'No-Sway,' 'No-Bounce' Weight Distribution Hitch doesn't just raise the bar, it sets it! Combining modern materials, technology and innovation, it’s the simplest, quietest, and most advanced weight distribution hitch on the road today. This is a first in the industry giving trailer owners the best anti-sway option AND the only true Motion-Dampening system (anti-bounce) around. Owners can't believe how smooth and quiet the ride is! I couldn't tell you how this hitch is because the factory sent one of the brackets for a different size frame so I can't install it. Their quality control is a little suspect. I wish I had never gotten it, I should have stuck with a more tried and true brand. When I called Andersen's customer service about the bad bracket they just blew me off and said I'd have to go back to the dealer to take care of it. I like the concept of the hitch but the company has a lot to be desired, it would be hard for me to recommend an Andersen hitch just out of principle. I bought this hitch thinking I would install it myself on my new Lance 1685. My dealer carried other brands. When I showed up with the Andersen, they asked to install it since they had heard about, but had not seen one. They were impressed with the quality and easy installation. I like the ease of connect/disconnect and how quiet it is. I installed this myself on our Lance 1685 travel trailer using the Andersen instructions plus a Youtube video. Both the installation and the set-up were trouble free and went smoothly. Driven 200 miles so far and I don't even know the trailer is on the back of our Grand Cherokee! No noise from the WDH whatsoever, everything is very smooth and it is so easy to disconnect and connect. Well made, works well. A little tricky to adjust. Bought this hitch on the recommendation of the Lance Owners of America group. Opened the box on receipt to put it together as suggested by LOA,on my work bench first. The ball housing did NOT fit into the shank properly so the shank bolts did not fit. I called Andersen and Mike, the Colorado Andersen rep said he would send a replacement ball housing and it would arrive in two days. After a five day wait we left town for a trip we had planned. Got back a week later still no replacement ball housing. Called Shadow Trailers to request a return. Shadow was great put me in touch with Steve at Andersen. He sent the new ball housing immediately. Looks like it will work. I'll let you know. Wish me luck. Shadow Trailer cares about the customer. I will buy from them and you should too.